Pendleton’s Legendary Blankets are admired and treasured for their intricate, intriguing patterns and excellent quality. These original designs are inspired by Native American art, legends, belief, ceremonies and heroes. Native artists such as Lillian Pitt and Joseph Chamberlain have designed for the series. Every design is exclusive, and each blanket has a commemorative label telling the design story. All blankets are napped, felt-bound and made with pure virgin wool in the USA. 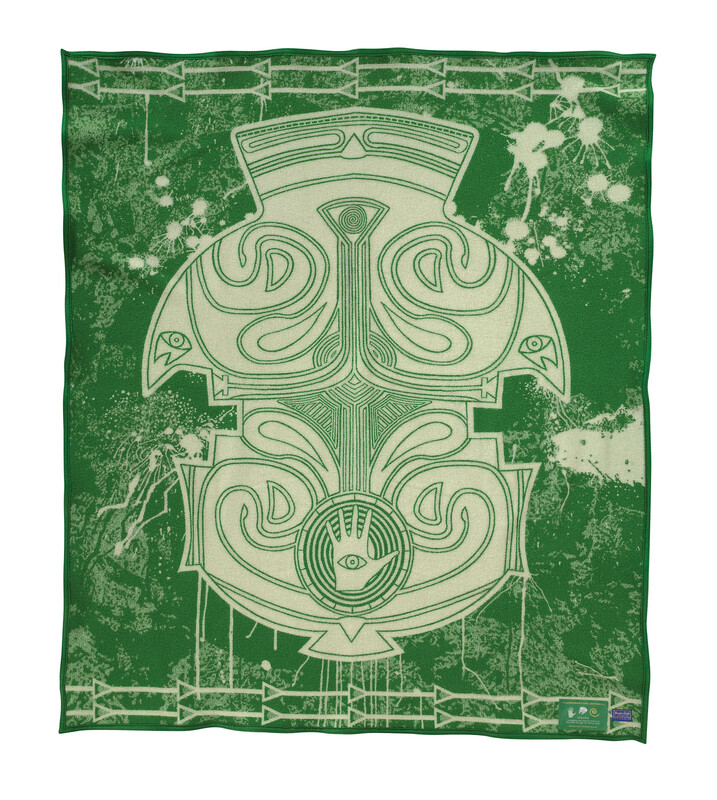 The 2012 Spring legendary blanket is based on an original design by Chickasaw artist Dustin Mater. The blanket is rich with symbolism common to several tribes of the Mississippian/Muskegon culture of the southeastern United States. Mater’s design represents the annual rebirth of the Earth through the spring rains. The vivid shade of green signifies a fresh beginning and the promise of new life and prosperity. Central to the piece is a spiral, illustrating the human soul and its cycle. Another important symbol is the pashofa paddle. This long wooden tool is used to stir pashofa, a traditional hominy dish central to the Chickasaw diet and cultural tradition of food and community gathering. Woodpecker eyes are emblematic of good luck, happiness and wealth. For a century, Pendleton Woolen Mills has woven the legends and symbols of Native American tribes into beautiful blankets. Native Americans were our first and remain our most loyal customers. In the early 20th century, Pendleton was among the few American mills making blankets specifically for the Indian trade. For more than a hundred years, Native Americans have acknowledged births, death and major milestones and accomplishments with the gift of a Pendleton blanket. A Pendleton blanket continues to signify honor and respect. Visit us at Pendleton-usa.com to see more blankets in this series.